The use of hot water systems for process heating pre-dates World War II, and initiated an ongoing effort for engineered materials to accommodate higher pressures and temperatures. After WWII the need for instantaneous hot water generation, distribution and precise temperature control for industrial applications continued to rise. High temperature hot water systems became increasingly popular because they were relatively inexpensive to install, provided long operating life, and were inexpensive to operate and maintain. Their closed system design made these systems more tolerant to corrosion and scale, while the use of pumps eliminated the need for complex piping for managing condensate. 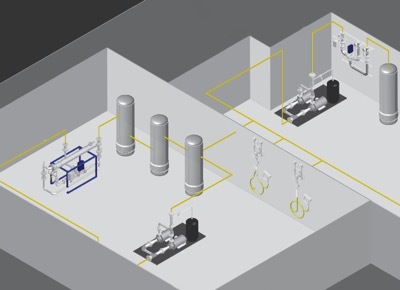 By developing a comprehensive strategy that includes state-of-the-art water heaters, water temperature controls, hose stations, variable frequency drive (VFD) pump assemblies and ancillary accessories such as storage tanks, and pressure-reducing valves, processing plants can improve efficiency and safety, and increase production and yield. Steam/water hot water systems with digital control technology and instantaneous heat exchanger design—shell and tube or plate and frame. Industrial mixing center with digital control valves, pre-piped as an IMC with requisite installation components for compact design and ease of installation. Digital control valves for delivering hot water immediately on demand, and maintained at precision temperatures (+/-1°F, +/-0.5°C). VFD pump assemblies application-engineered and configured for your site. Hot & cold water hose stations with thermostatic mixing valves that replaces the old, basic Y as the temperature controller. The brochure below, courtesy of Armstrong International, provides more insight where specific components are used. Hot Water for Industry from Mead O'Brien, Inc.